This past week, Microsoft released the second new build of the year to Windows Insiders who are set to use the Fast ring in Windows 10 Technical Preview. There are a number of changes, improvements, and known issues in build 10041. I have been testing the new build for the last few days to look at the changes. I will be giving my thoughts on those changes in this review as well as discuss the update process used to install the new build. Microsoft released some information about the build release plans. Users on the Fast ring must already be running a Windows 10 build before they can update to new builds and the builds will only be available as part of the Windows Update functionality. When builds get released to Windows Insiders who are set to use the Slow ring, ISOs of the build will be released as well. 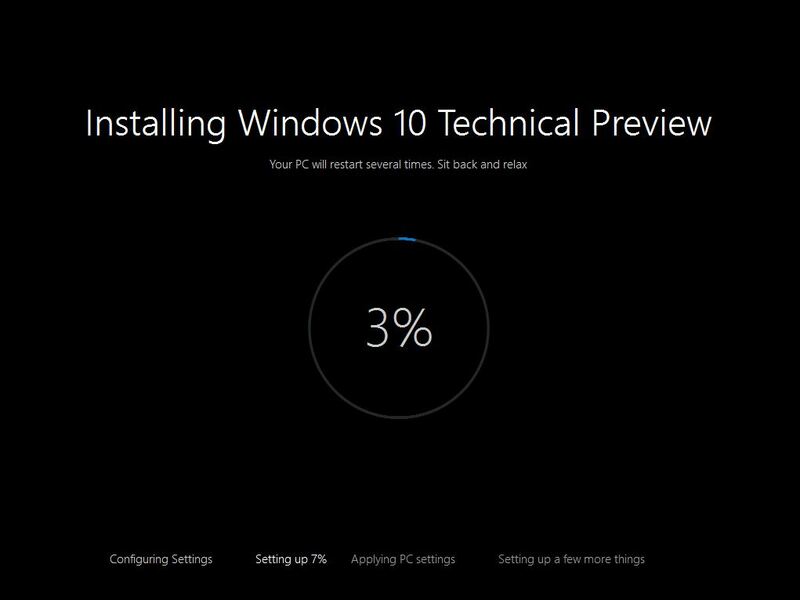 Once the ISOs are released, users can download and install the technical preview without having Windows 10 Technical Preview installed. Microsoft also stated that users on the Fast ring should start seeing more frequent builds and fixes for existing bugs but Microsoft also stated that there would be an increase in the number of bugs in the builds and a decrease in the number of workarounds that Microsoft has found for mitigating the effects of the bugs. Instead of using a Preview builds section like previous updates have done, Build 10041 is the first one to use the Windows Update functionality for installing the new build. I have been having some issues with installing updates using the build 9926 version of the technical preview so I had reinstalled Windows 10 Technical Preview build 9926 before starting with the update to the build 10041 so that I was using a clean install of Windows. After reinstalling Windows 10 TP, I went to the Update and Recovery section in PC Settings. On the Updates screen, I had to click the Advanced options link and then change the setting from Slow to Fast so that the new build would be available to me. As I was not fully up to date with the patches after the reinstall, I also needed to install the patches before build 10041 showed up as one of the items to install. With Windows 10, updates will automatically install but users can also manually look for updates which is what I chose to do because the new build was not showing as an available update for me initially. It was during the update to Build 10041 that I saw my first change with the update methods Microsoft is using. Microsoft has added a screen during the update process for the new build that displays the progress. This new screen includes a circular progress bar that shows the percentage of the update completed as well as showing the step that the update is performing. This new screen cannot be bypassed as it is displayed through the computer restarting multiple times during the update to build 10041. When I initially was trying to install updates for build 9926 so that I could upgrade to build 10041, they would fail every time. I then downloaded and installed the ISO for build 9926 as the new ISO for this build will not be available until the build is released to the Windows Insiders’ Slow ring. After installing 9926, updates initially installed and. When I tried to install the next set of updates, the updates failed to install. After trying to update again, the updates installed and the new build was in the list. During this attempt to install the updates, everything did install. On my laptop’s VM, I had to restart the VM before the updates would install after the failure occurred. Looking in the Windows 10 feedback, there are other users that had similar issues so I would guess that this issue will be resolved soon. 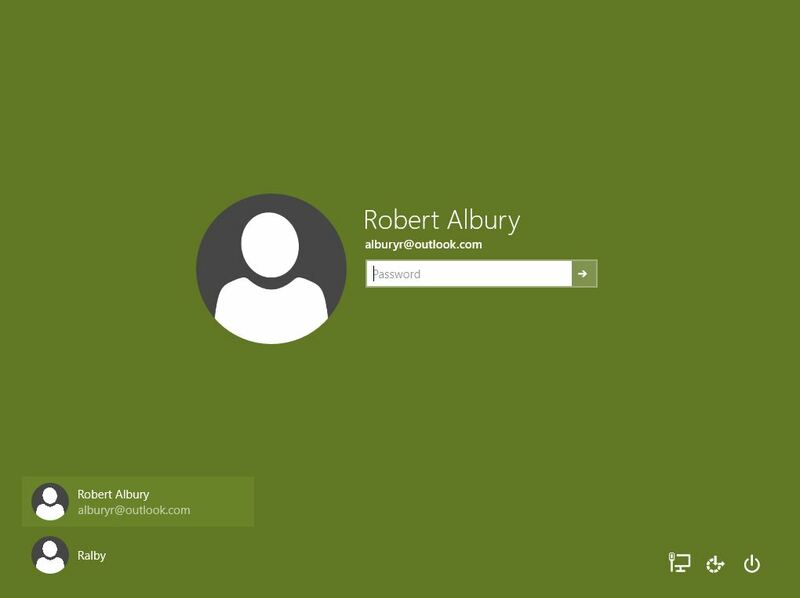 After the update to build 10041 completed, I noticed some changes to the login screen design. The main change I noticed is that users no longer need to click the left facing arrow to change users. Instead, if there are multiple users on the computer, users can click on the needed profile and the login portion of the screen will change to the selected profile. In the system tray, I also spotted a change in the appearance. I don’t know if it is intended but there are two arrow icons for showing the hidden icons of programs running in the background such as Dropbox or Onedrive. Both arrow icons have the same functionality when selected. The Start menu also has had some changes that were made. It looks as if Microsoft has continued the implementation of the new flatter look in this build. The File Explorer, Documents, and Settings options had their icons removed in the Start menu and the Places header above them was removed in this build. The multi-arrow icon in the top right has been changed to a diagonal line with an arrow on each end. The functionality is still the same for everything as the changes are all cosmetic. Microsoft continued with adding and improving features in this build with a number of features added along with improvements to several existing features. In addition to the changes I observed initially in build 10041, Microsoft improved the Start experience by adding transparency when the Start menu is visible. I couldn’t tell much of a difference in the transparency though until I was looking for it. There currently is not a way that I have found to adjust the transparency to allow users to make the background more visible. In addition, the tiles cover much of the Start menu screen anyway and the tiles block out the background. This is strictly a cosmetic change and personally I don’t care if the background is transparent or not as I normally only open the Start menu to run programs or load Windows functions like the Control Panel. Microsoft also made a couple other changes. The first change was to make the All Apps button easier to use with touchscreen devices by making the All Apps button larger. The second change was a request from many users that will benefit people on computers and touchscreen devices. That change was to allow users to click and drag program shortcuts to the taskbar from Most used or All Apps in the Start menu. 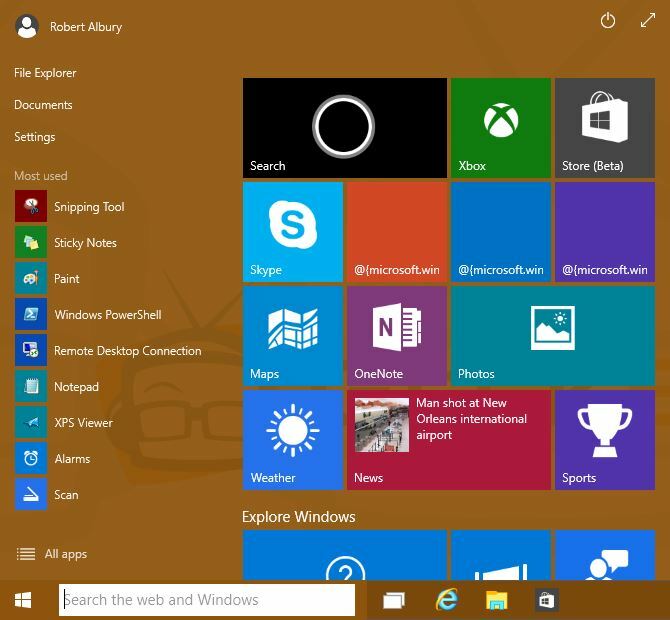 The two images below will show how the Start menu appeared in Build 9926 and how it appears now in Build 10041. The Start menu from Build 9926 is on the left and Build 10041’s Start menu is displayed on the right. Microsoft announced that Cortana will now work on desktop computers in the UK, China, France, Italy, Spain, and Germany. Users can currently search the web as well as search for settings, apps, and files. 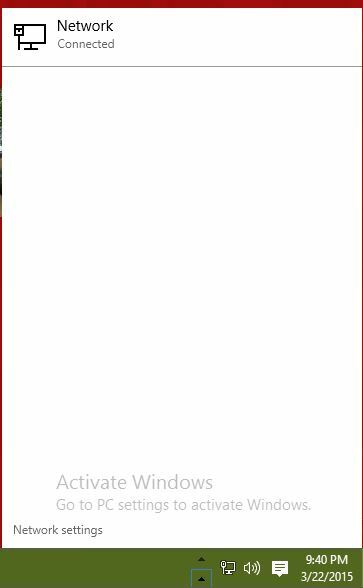 One issue that Microsoft fixed in this build is a bug that was preventing users from using Search when the taskbar is positioned at the top or the sides of the screen. Text Input Canvas is a new feature added for touchscreen device users. Text Input Canvas is an updated handwriting recognition feature for short text entry. It also will provide suggestions and word predictions. I was not able to test this feature as I have not gotten a touch input capable device yet. Microsoft stated that they are experimenting with different options for the lock screen. Currently, many users are seeing images on the lock screen but some users were seeing images and a message on the lock screen in build 9926. Microsoft is going to be looking at displaying tips, tricks, and questions asking if users are aware of specific Windows 10 features. For now, only the United States and France will see the messages on the lock screen but Microsoft will be expanding this testing to other countries. Microsoft added the ability to drag widows to virtual desktops in build 10041. In previous builds, users had to right-click on the window and then use a context menu. Microsoft also stated that users can drag windows to the + symbol which will create a new virtual desktop and move the window in one step. I can see how this could benefit users in keeping the desktops organized. Microsoft is still doing some testing on this feature so more changes may occur. They also added a filtered Alt+Tab functionality so that users only see the apps open on the current desktop. The Photo app received some attention in build 10041. The Live tile will now show photos stored in Onedrive in the recent photo rotation. Prior to this build, only local photos would show up in the rotation. There also have been improvements in the support of RAW image formats. Numerous other performance and reliability fixes have been implemented as well. A set of keyboard shortcuts for the Photo app have been released but there will be more shortcuts released. An issue with persistent gray thumbnails in the Collections view also should be fixed in this build. 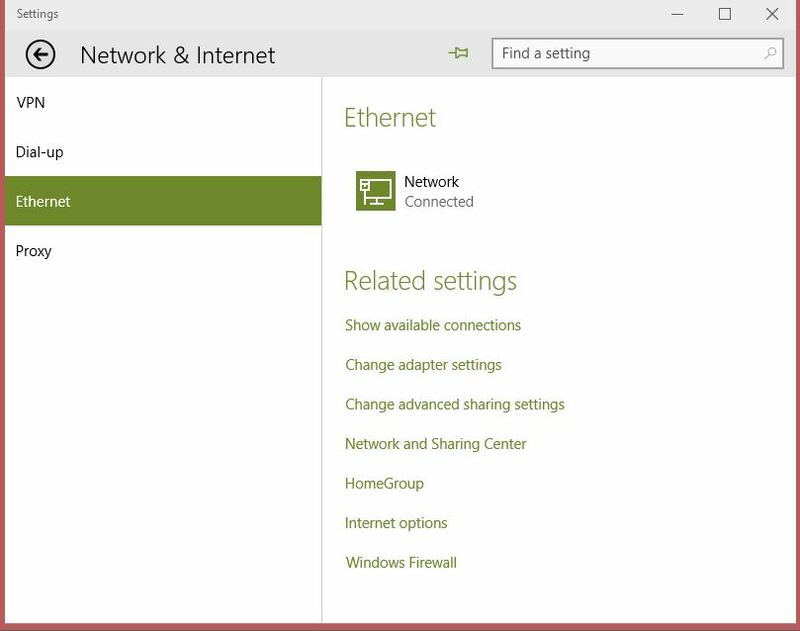 The flyout for network information has been redone in build 10041 to make it easier to access network information. The first image below shows what the new flyout looks like. In addition to the changes for the network flyout, Microsoft also changed how the Network & Internet section is displayed. When clicking on the network in the flyout in build 10041, the image below will load. There are a couple of changes in this build. First, there are fewer options in the left frame as the Network & Internet section has been revised. Also, the Advanced settings options have been moved into a new section called Related Settings which appears on the appropriate screens. Some other changes in build 10041 include changes to how feedback is handled for the Windows Insider Program as Microsoft made changes to the Windows Feedback and Insider Hub. These changes were based on feedback from users. Microsoft also continued with the implementation of the Modern UI flat icons as more icons have been converted to Modern UI versions in this build. In addition to other fixes that I mentioned already, two major problems that Microsoft fixed in build 10041 are the resolution of several issues that would prevent Start from launching and the resolution of the boot selection menu appearing each time that the PC was started. As with previous builds, there are a number of known issues in this build that Microsoft identified. When trying to login, users may encounter an issue where they cannot enter their username or password or the information doesn’t show in the text fields. Microsoft gave three options for resolving the issue. These options are to click the Switch User button, use Ctrl+Alt+Del, or to restart the PC/device. Users can lock themselves out of the PC during the initial account creation process. If this happens, users will have to restart the computer and restart the account creation process. There are a number of accessibility related issues in this build. These issues may cause problems with using Narrator or other 3rd party reader apps. In addition, there may be an issue in which the display may be unusable if Magnifier is enabled and then Lens is used. Also Narrator related, there is an issue for touchscreen users in which the touch keyboard does not appear if Narrator is turned on. There are licensing issues related to some apps that users may encounter. A possible workaround is provided but the workaround involves uninstalling the apps using powershell (an advanced command line interface) and then reinstalling the apps from the Store (green tile version). This licensing issue also ties to the Store (Beta) and will prevent some apps from installing or updating. Microsoft also identified an issue in which windows that are open on the desktop may be visible behind the Start menu, Snap Assist, Task View, and when rearranging windows in Tablet Mode.. Only the wallpaper/background should be showing behind these items. When creating virtual desktops, users may see missing or black thumbnails in Task View. Currently, notifications for Tablet Mode are disabled while Microsoft works to fix issues that have been found. Users can manually re-enable notifications if desired. The Photos app will crash immediately after opening when users take a picture and then tap the circular icon on the top left of the display. Users may see prompts to restart the computer to install updates even if there are no updates that need installed. Users can ignore these prompts. On the Lock screen, users might see a chess knight icon. This was added on the new lock screen so Microsoft’s lock screen team could identify whether a screenshot was showing the old or new lock screen. There also is an issue with font sizes on devices displaying a high DPI in which the font will display in a very large size. 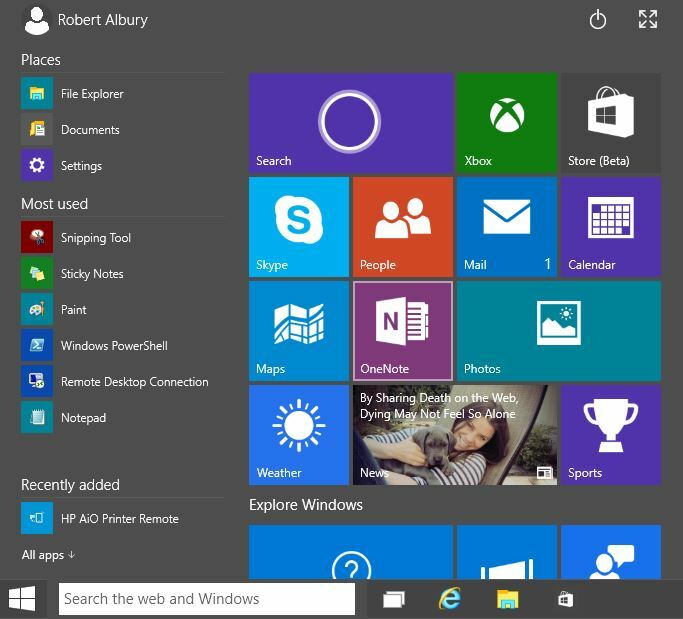 Microsoft released its most recent build of the Windows 10 Technical Preview this past week. There were a few new features added in this build as well as a number of improvements and changes to existing features. There were several known issues identified by Microsoft as well. Overall, I still am looking the overall improvements in Windows 10 and I am still planning to install Windows 10 on my computers when it releases later this year. If there are any questions, comments, or concerns about anything I have covered in this review, please feel free to comment below or email me at the address in my bio. I apologize for the delay in responding. I have been busy with work and other issues. I’ll look into the issues mentioned here this weekend when I have time to do so. In the meantime, the only suggestions I can offer are to do a search on the Internet to see if others have had issues, to check the feedback section in Windows 10 to see if others are reporting the same issue, and if possible, update to the newest build of Windows 10 TP. The newest build that is out is 10049. Most MS store games either won’t run or crash when using them. Steam games won’t launch at all. Worst still, I get memory read error and complete lock up when shutting down. hey! Why is my win 10 build 10041 does not going top to the internet?? I have just installed 64 Bit 10041, on a PC that I had the previous version of 10 running fine! 10041 is slow in comparison and most preinstalled apps don’t work. It seems to be a retrograde step from the previous version, which worked fine. If MS are releasing a retail version in the summer, it would seem they have lots of work to do!! I hope in WIN 10 when on the email page and you swipe up from the bottom, they put the print command there instead of making you click “more” to get to the print command as in 8.1.